I fought the English troops at Gallipoli for an Ottoman country that no longer exists-even though I continued living on the same land. Soldiers' diaries, particularly those from World War I, have been a constant reminder of the horrors of war. A large stock of such memoirs have reached us from the ranks of the Allied forces, particularly from British, French, American, and Anzac soldiers, as well as from Austrian and German soldiers fighting for the Central powers. Much less material has been available from the Ottoman side, particularly from the Syrian provinces. This book analyzes the Great War from the perspective of three ordinary soldiers who fought on the Ottoman side, as expressed in the newly found diary of Private Ihsan Turjman and journal of Lieutenant Aref Shehadeh, both of Jerusalem, as well as in the published Turkish diary of Mehmet (Muhammad) Faqih of Mersin. It explores two important ways in which the Great War impacted the Ottoman Empire. First, it examines how the experience of the war transformed the consciousness and the living conditions of the people of the Arab East (Ottoman Syria)-a shift that historians sometimes describe as the onset of Arab modernity. Second, it looks at what Falih Rifki, the Ottoman essayist and modernist, called-with the benefit of hindsight-the "Turkish problem" in Syria: namely the inability of Ottoman constitutional reform to create a multiethnic domain in which the Syria (including Palestine) would become an integral part of the empire. The crucial time for both these transformations was the short but critical six-year period between the constitutional revolution of 1908, with its project for a representative, multiethnic state, and the collapse of this project under the dictatorial regime of Jamal Pasha. While the events discussed in the diary in the second part of this book center in the city of Jerusalem and show the war's impact on the urban population, they also had a significant impact on the region as a whole. Jerusalem, we have to remember, was the administrative and political center of a huge Ottoman province, the Mutasarflik of al Quds al Sharif, which comprised more than half of what became Mandate Palestine. Its ashraf and notables were a critical elite with a major influence on Ottoman policy in Istanbul as well as in Jaffa, Hebron, and other regional centers. The devastation felt by the city during the war-food shortages, disease, pauperization, and mass deportation-was repeated throughout the region in various degrees. The city was the crucible in which the breakdown in the normative system, and the subsequent rupture with the region's Ottoman past, was first experienced; from there, the turmoil engulfed the rest of the country. The hero of our story is Ihsan Hasan Turjman (1893-1917), a common soldier in the Ottoman military headquarters in Jerusalem. His life was short and uneventful-he served as a clerk in the Manzil (Commissariat) and briefly as a foot soldier in Nablus and Hebron-but his observations on the impact of military events on his relationship to his city and his nation are without parallel. The power of wartime diaries lies in their exposure of the texture of daily life, long buried in the political rhetoric of nationalist discourse, and in their restoration of a world that has been hidden by subsequent denigration of the Ottoman past-the life of communitarian alleys, obliterated neighborhoods, heated political debates projecting possibilities that no longer exist, and the voices of street actors silenced by elite memoirs: soldiers, peddlers, prostitutes, and vagabonds. By the third year of the war, the diaries of such ordinary soldiers project a desperate search for normalcy in daily life-a normalcy that was experienced in prewar Ottoman Palestine but seemed to elude its citizens for the next hundred years. The Great War brought about a radical break with the Ottoman past in the whole Arab East, not only in the established constitutional regime but also in the system of governance, local administration, and identity politics. In the popular memory of peasants and city folk alike, 1915 was the Year of the Locust (?am al Jarad). Even four generations later, the locust invasion continues to evoke the combined memory of natural disasters and the manmade devastation of war. These events erased four centuries of a rich and complex Ottoman patrimony in which popular narratives of war and nationalist ideology colluded. An anti-Ottoman rewriting of history took place simultaneously, and in the same abrupt manner, both on the Turkish side (in the guise of modernizing the state and making it geographically manageable) and on the Arab side (in the sustained annals of nationalist historiography). The erasure replaced four centuries of relative peace and dynamic activity, the Ottoman era, with what was known in Arabic discourse as "the days of the Turks": four miserable years of tyranny symbolized by the military dictatorship of Ahmad Jamal Pasha in Syria, seferberlek (forced conscription and exile), and the collective hanging of Arab patriots in Beirut's Burj Square on August 15, 1916. This book deals with the totalizing and transformative nature of the Great War. The war was totalizing not only in the manner in which it molded soldiers' work and living habits but also in its impact on the daily lives of civilians, creating an atmosphere of continued panic and uncertainty and disrupting daily patterns of behavior. This anxiety often took the form of persistent concern about food, clothing, and the availability of essential commodities such as kerosene and tobacco, as well as fear of arbitrary army actions (arrest, transfer of populations, and conscription of older people as the war progressed). This period also saw the first systematic censorship of the press and of people's private mail. In a related process, the Great War had transformative effects on social norms. In the absence of adult male household members-who either were conscripted or perished at the front-many families suffered extreme poverty, famine, and disease. People were driven to drastic measures that undermined traditional normative behavior. Begging, theft, and prostitution became daily features in the streets of Jerusalem. The war ultimately helped redefine the nature of the state and its relationship to its subjects. In Palestine the war was a watershed that separated the country from its Syrian expanses and brought British colonial rule, creating new borders, new citizenship, and new forms of national consciousness. 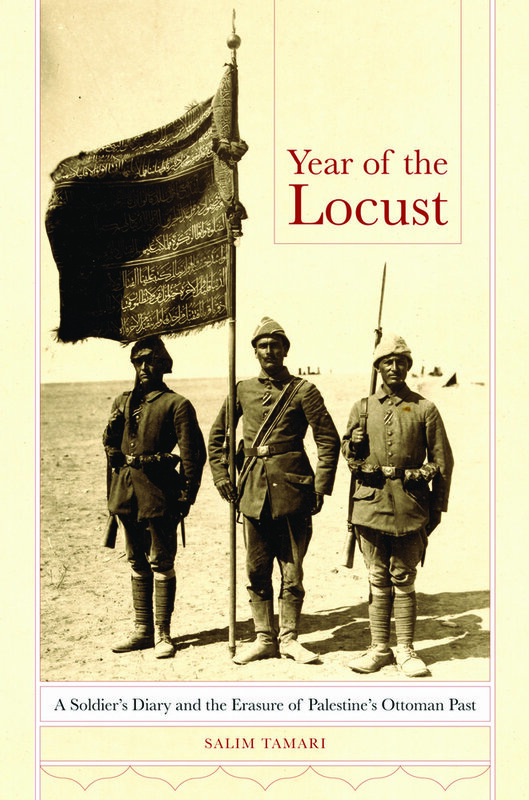 Year of the Locust captures in page-turning detail the end of the Ottoman world and a pivotal moment in Palestinian history. In the diaries of Ihsan Hasan al-Turjman (1893–1917), the first ordinary recruit to describe World War I from the Arab side, we follow the misadventures of an Ottoman soldier stationed in Jerusalem. There he occupied himself by dreaming about his future and using family connections to avoid being sent to the Suez. His diaries draw a unique picture of daily life in the besieged city, bringing into sharp focus its communitarian alleys and obliterated neighborhoods, the ongoing political debates, and, most vividly, the voices from its streets—soldiers, peddlers, prostitutes, and vagabonds. Salim Tamari’s indispensable introduction places the diary in its local, regional, and imperial contexts while deftly revising conventional wisdom on the disintegration of the Ottoman Empire. Salim Tamari is Professor of Sociology at Birzeit University, Palestine, the Director of the Institute of Jerusalem Studies, and the author of Mountain Against the Sea (UC Press).